Sunstone will encourage optimism and a desire for action. It will provide a change towards positive events and offers new perspectives, even to stubborn pessimists. 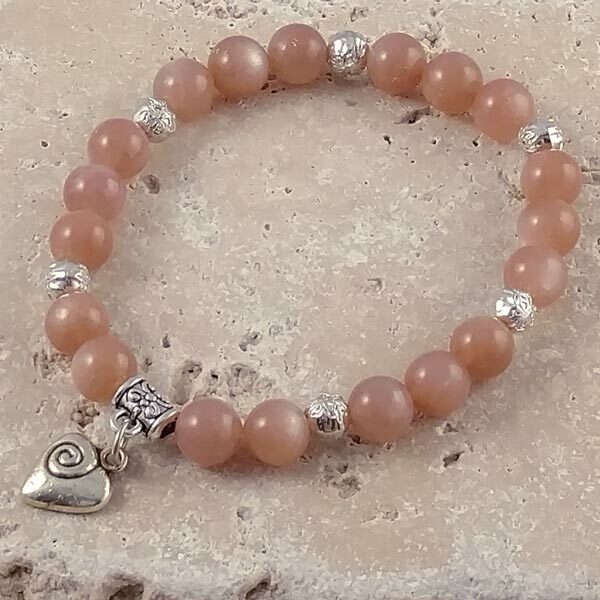 Absolutely yummy Sunstone with fine pewter rose bud shaped accent beads and a heart charm in a wonderful healing bracelet. I personally string these on 1mm, heavy duty stretch cord. Heart charm is 1/4" and fine pewter (no cadmium, nickle or lead). Clears blocks in this Chakra. Clears what impedes one to fulfilling their life purpose, helps in completing karmic contracts, evokes courage, heals fear, offers the candle of hope in the darkness. 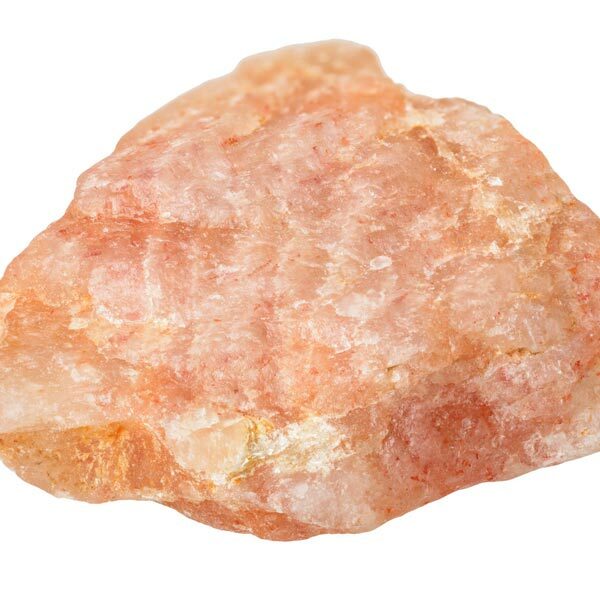 Sunstone has a Triclinic crystal system and is in the mineral class of lattice silicate, the feldspar family. Its orange to brown appearance comes from microscopically thin Hematite platelets. The mineralogical term for Sunstone is Aventurine Feldspar which unfortunately, many times leads to it being confused with the green Aventurine Quartz. While it is found in many places around the globe, some of the finest examples come from Norway. The Sunstones I offer have come from there. Their mixture of sodium and calcium aluminum silicates have quite beautifully encased the Hematite inclusions that so brilliantly reflect and flash from one plane to another. Sunstone may be worn as a pendant or held as a hand comforter. Used in a stone circle, this one provides a spiritually and emotionally uplifting effect. Sunstone helps us discover and live out our inner nature. It aids in affirming our lives and allows our strong points or "sunny side" to shine. It provides a renewed belief in luck, happiness and the benevolent gods. 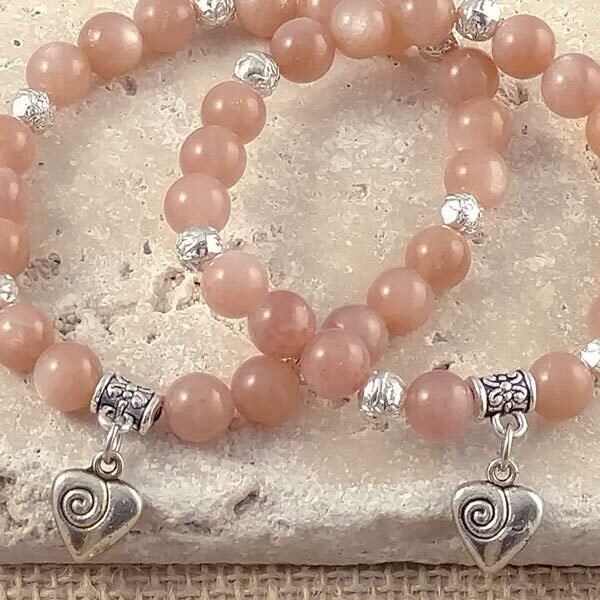 Sunstone brings about the joy of life. Its mood lifting, anti-depressive effect assists us in detaching from feelings of disadvantage, discrimination and failure, and images of a bad world. It also increases self-worth and confidence. Sunstone will encourage optimism and a desire for action. It will provide a change towards positive events and offers new perspectives, even to stubborn pessimists. Sunstone will facilitate self-healing powers by stimulating the autonomous nervous system and ensuring a harmonious functioning between all organs. Libra and Leo have a special affinity with Sunstone. Its Energy is Projective, its Planet is the Sun, its Element is Fire and its associated stone is Moonstone. Sunstone represented the sun god in ancient Greece and it provided life and abundance for those who carried it. In ancient India it was held to provide protection from destructive forces from other realms. Canadian Indians used Sunstone in rituals with the medicine wheel. It was placed at the center of the medicine wheel and was reported to emit a golden glow when it came in contact with spirit guides. A Sunstone placed in a bag of healing herbs will strengthen their energies. Additionally, if carried or worn, it provides extra physical energy to the body during times of stress or illness.